It's that time of the year where we take the opportunity to ask our amazing support team of friends and family to join us in supporting the March of Dimes. 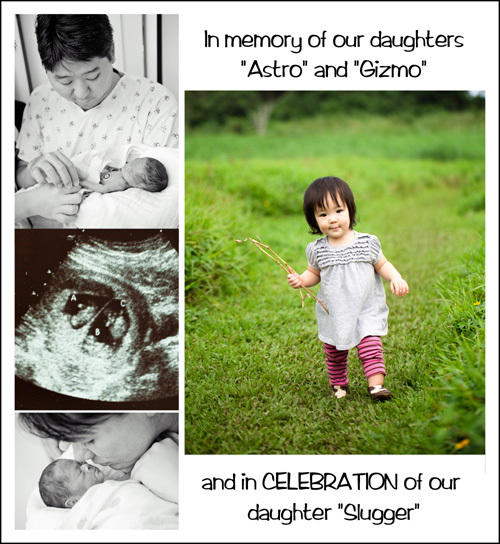 2010 was a rough year but we've come so far since then and we don't want to forget the people and the medical efforts and tools that has helped Slugger get to be where she is at now. We spent 81 hard days in the NICU, some of those days were and are still the worst days in my life, but I can't even express how much worse it would have been if Slugger wasn't here with us today. March of Dimes sole purpose is to provide support and funding for research that has bettered the lives of premature babies and their families. In 2011, Team Slugger was represented by members walking the March of Dimes Walk both here and in New York. And we're doing it again this year!!! Please check out our fundraising pages and you can help us reach our goal. But please don't feel pressured to give!! Scott and I always talk about how there are just so many great causes, this is just one that hits home for us. It's a way for us to show our gratitude and thanks just by showing up! And we love the reminder of what a great group we have by our side. If you want to show your support by joining us for the walk, you can choose to register or just show up to encourage us by walking 5 miles with us. Walking strong at 20 months old!! !